Are you searching for “Car Dealerships That Accept Bad Credit“ or “Bad Credit Car Dealership Phoenix” while looking for no credit used car dealerships in Phoenix? If so, In-Power Motors LLC can help! Whether or not you have bad credit or good credit, or no credit at all, we will work on your behalf to get you into the vehicle you want, and because we understand how credit works and most credit issues, we have the ability to do just that. It is our number one goal to see to it that you are happy with the vehicle that you purchase from us, because we want you to be able to recommend us to your family and friends, and we also would like to have you return to us should you want another vehicle in the future. Our customer referrals show that we did something right! Because of the variety of ways available today to shop form a vehicle, this also includes online vehicle shopping, we have taken things a step further by learning to understand those interested in purchasing cars in our local community, and by satisfying their needs. 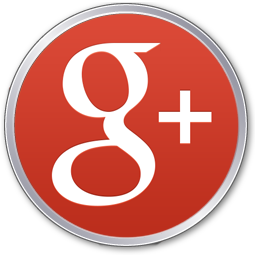 To sum things up, we enjoy being of help to our customers, customers like you! This is why we work hard to find you the vehicle that is going to meet all your needs. Buy It Here, Pay For It Here, That’s Our Motto! The lots that let you pay for the vehicle your buying, at the same place you initially purchased it is going to allow an easier way in purchasing that vehicle your wanting. Here at ‘In-Power Motors, LLC’., we offer you three different means to conveniently shop for your new vehicle with three convenient locations throughout the Phoenix area. You will be able to stop into one of the three locations, make a choice on the vehicle you want, and leave in your new pre owned vehicle that you only had to put a $500.00 down payment on. Plus, you will leave knowing that you have an affordable monthly payment plan. 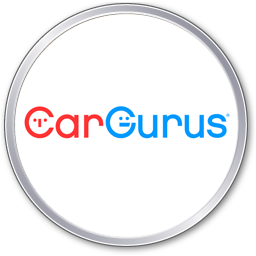 If you are in search of a new vehicle, but have bad credit, or you have no credit at all, we can help you with that! So, if you are in a predicament and need to get a new vehicle come to one of our three locations and we can fix you up with that new vehicle and have you on your way home in a pre-owned vehicle with our in-house financing, which gives us the ability to approve nearly everyone. We are considered to be the best used car dealer around the Phoenix area that excuses you for not having good credit or no credit at all. Click the links below to search our used car inventory, which you would only have to have $500 down payment on. *Note: all of the vehicles in the list below may not: (1). Be in stock. (2). Fall under the $500 down promotion. In which case you might have to be pre-qualified for the $500 down promotion. Because we are buying and selling used vehicles daily, our inventory changes just as often. Please, feel free to search our inventory online to see if there is one you might be interested in. In the meantime, you can fill out and summit an application request, and you can call us and schedule a time that is good for you to take the vehicle you are interested in for a test drive. 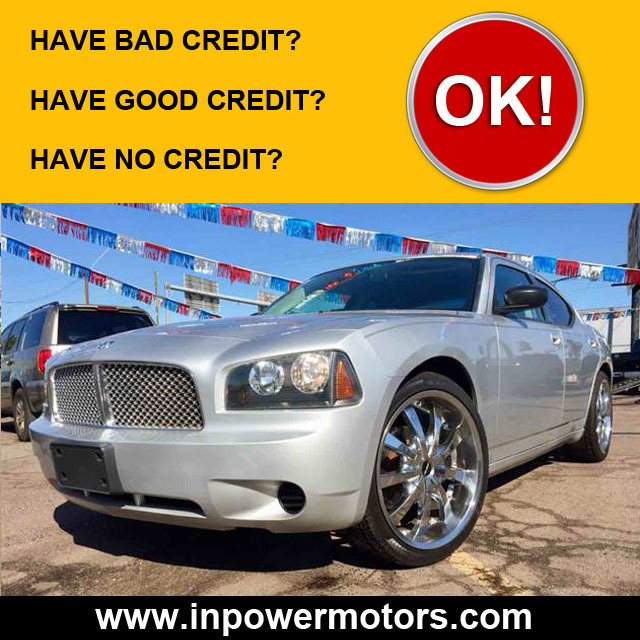 If you are interested in applying for a bad credit vehicle loan with ‘In-Power Motors, LLC., go online, it’s that simple. All you have to do is click on the link, and it will take you straight to the page where the application is located, fill it out and summit. Some of the information that will be ask for: Name, Address, City, State, Phone number, Email Address, Date of birth, Driver’s License number, Renting or buying home information, an Information about your employer. 5 Star Review: “Awesome first time experience! Great customer service. Moises and mary attended me. They make you feel welcomed. They try their best to get you into a car with bad or no credit. They will work with you in anything. Best dealer I’ve been to so far. Me and the hubby got what we both wanted in one car.” Kassandra V.
We have 3 convenient bad credit car dealerships in phoenix to serve you. 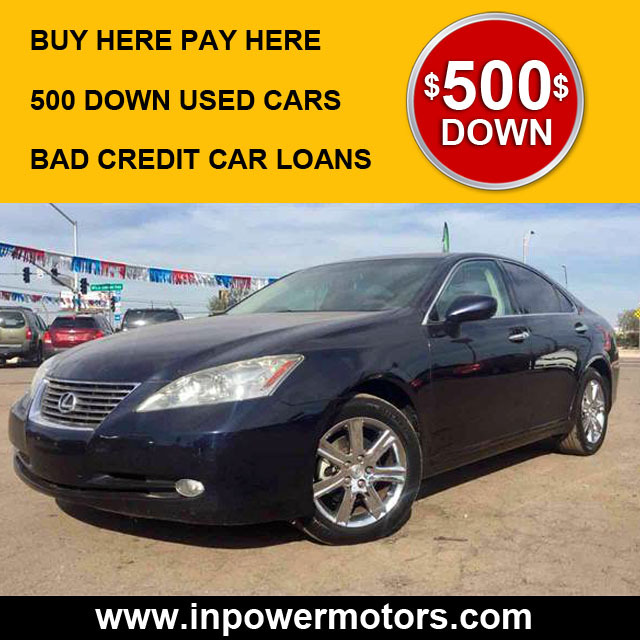 Stop by In-Power Motors at 2301 West Buckeye Road Phoenix, Arizona 85009 today, give us a call at 1-602-648-5275, or search online to find used cars, trucks, and SUVs to fit your budget. Our main location is right off the 1-17 and Buckeye. View more bad credit cars & trucks cars & trucks at our other location on 2505 W Van Buren St. Phoenix, Arizona 85009. We have 3 convenient bad credit car dealerships in phoenix to serve you. Stop by In-Power Motors at 2301 West Buckeye Road Phoenix, Arizona 85009 today, give us a call at 1-602-648-5275, or search online to find used cars, trucks, and SUVs to fit your budget. Our main location is right off the 1-17 and Buckeye.